If Knowledge emerges from practice, and practice emerges from knowledge, (situations, reading, writing, discussion, viewing others artwork- in short interaction) who do we credit in the work? Is it possible to credit all those things which have influenced our view when this emerges both consciously and unconsciously. To document an event is a strange thing. Here I refer to documenting in a literal sense, to taking photographs of a happening or to transcribe conversations, as was my experience recently. Even within transcription the way in which you choose to transcribe, the layout of the words on the page, even though you are re writing what has been directly spoken, has a degree of subjectivity. In photographs we see this even more so as the photograph suggests a viewer and a particular standpoint. The nature of this sort of open ended collaboration in which we are participating in, allowing for personal exploration into different directions creates a different dynamic if we consider that each of the individual agents of the collaboration has a different direction in which they wish to proceed. 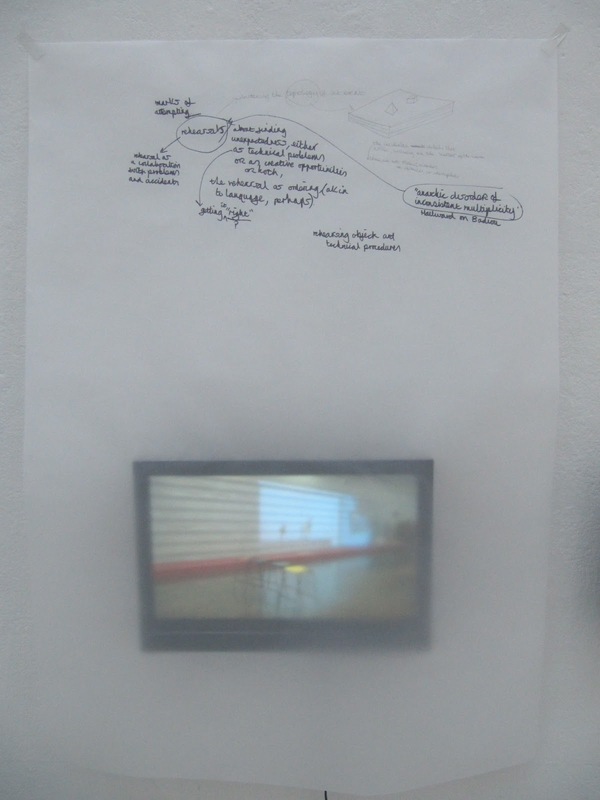 In this way a single photograph of documentation of an action initiated together could be seen to mean different things to each of the collaborators. So in that way, all of us and none of us, own it. discussing the same events, often blogged at the same time or around the same time illustrates this. The same action viewed by different individuals leading to different points of discussion and different output from that interaction. The staccato of a blog enables a dipping in and out from the differing blogs, allows the viewer/user to create their own narrative to the events as very few blog users will read the blogs chronologically more often dipping into one, scrolling to another, the contiguity of how they read and interpret will be determined in part by the order in which each individual will read, and perhaps comment on. Adding to this the bogger is also reading what other participants have blogged and in this way the conversation continues. 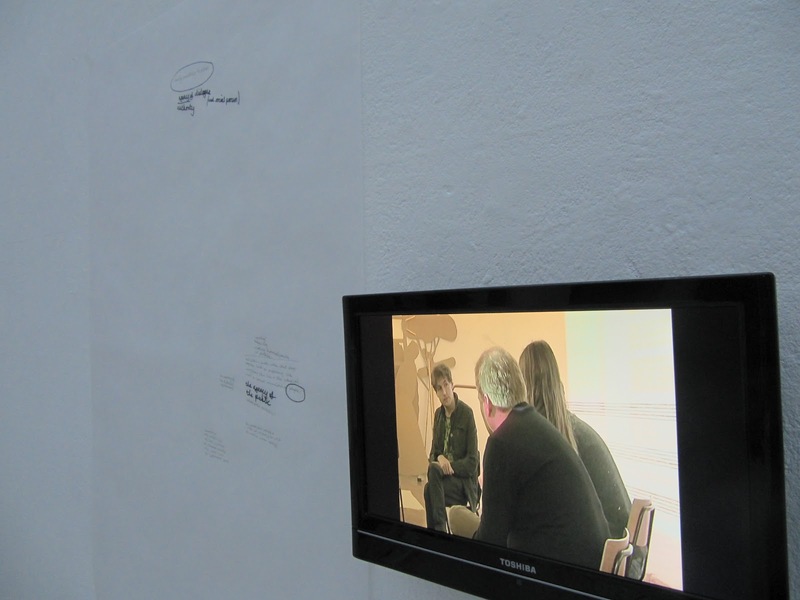 It is an interaction among the original participants and the user/viewer. 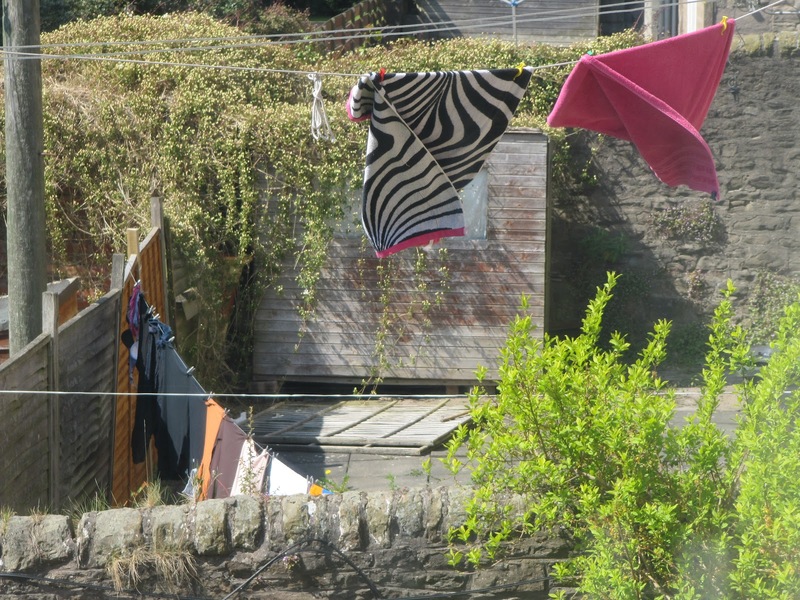 there is a zebra print towel drying on a washing line outside, it is flapping in the wind, catching my eye. 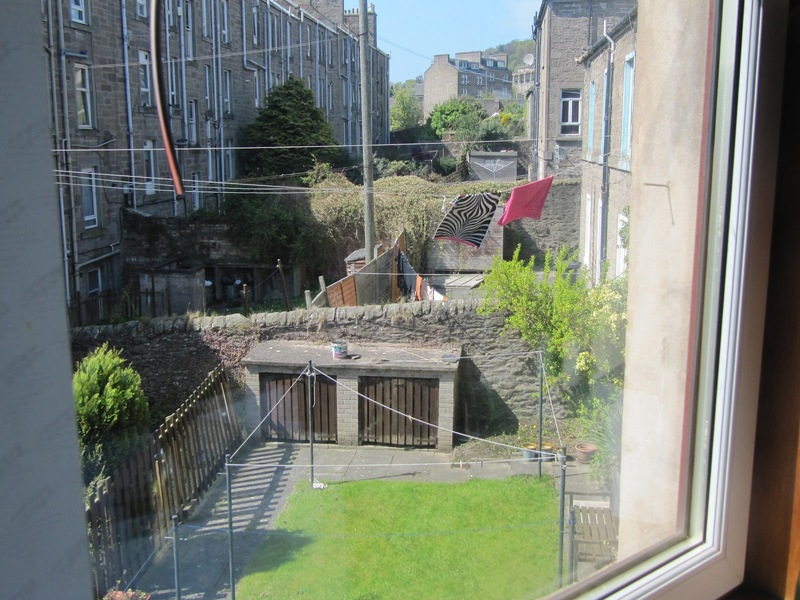 It is suspended from a washing line coming from a first floor window from a flat 2 doors up, to a pole in the garden. Right at my eye level. Recording sounds of an action has a similarly interesting contiguity of instances. I make sound recordings, some sound may interests me, this sets my thoughts running, and so I endeavor to capture that moment. I am constantly trying to collaborate with my surroundings, and to archive my thought. But within the context of An Event the recordings were generally not of actions which I was singularly making which I set to capture. It is the space and/or the agents within that space that sets me thinking and recording, and within my own practice I generally have a predesigned (even if it is reactionary) reason for doing this. However if my actions are in direct reaction to another artist’s work, is there co-authorship there, does it belong to the agents or to me as I am moulding their representation from my own subjective standpoint? John Dummett, on the Thursday of the events was in conversation with the other writers of An Event and the artists of A Cut A Scratch A Score, David Barnett and Sam Belinfante in the Hockney Gallery and he questions whether critical writing has the role of performing as a ‘textural afterlife of an experienced event’. 3 In this there is a crediting of the writers own output, their own work, as a thing in its self and the context in which it was running. It is neither and both a document of A Cut A Scratch A Score. It is not running from but running parallel dipping in and out, feeding from each other, progressing in different directions. It does in fact keep the actions of the original event alive after they have run their course, but they will be alive within the writers own view, authorship to the writer. In their further discussions at this time, David Barnett and Sam Belinfante alluded to a further manifestation of A Cut utilising the documentation of the week-long event. This is not a repetition of the happenings, but the restaging of the different elements. They observed will be a different beast entirely, yet it will still belong to the previous set of event to some extent because it is acted out by the initial collaborators. There was a sense of continuity in the way they were describing how new manifestations of the previous event will be formed. Pieces of this and thoughts and discussions from that, are forming into a whole new joint manifestation, or a few manifestations it seems. It seems there is no need for singularity in authorship when the agents are moving towards the same aim. This contiguity of forming a work refers me back to thoughts concerning writing in situ. As the audience/reader is privy to the act of making and in so doing inserts their influence on the space in which the writing is done, then are they therefore entitled to a degree of authorship? If a writer is drawing from the high pressured environment of a site writing event they will encompass all the influencing factors that space and conditions will impose. You often see books credited to an author’s partner or friend in reference to the supportive presence, or conditions they created in which the writing was done. Maybe in a more humanist approach we should start crediting humanity and society as a whole in our introductions. I go too far. The question of documentation and the viewer’s presence is intertwined within the practice of performance art. Here the public are often directly effecting the action or the inaction of the artist. If the documentation (another view) of the performance is not made the art work would still exist, similarly it would exist without the audience, however the action is still performed to another viewer,( the camera, the documenter). Omitting even this, it is still performed to the self, the view of the self, the viewer always important. However even if documentation of performance is made by the artist themselves from their predesigned view the documentation of the event is never the same as the live action. It is impossible to capture innumerable signifiers within that space which made that performance particular. It can never be repeated and never completely documented. We brought 9 Talbot square into the Hockney gallery. A re-staging of an idea of a place to form thoughts. A thinking square. It became a totally different thinking space within the Hockney gallery. Here it felt like an empty volume waiting to be filled. In 9 Talbot Square the volume was filled with its surroundings and it was easy to pick a point, a sound, or our discussions to fill the space. It was intended to act in this way within the white space but it evolved into a representational volume, (aesthetically interesting one would hope) not a talking space, instead it seemed to function within a context for the whole. 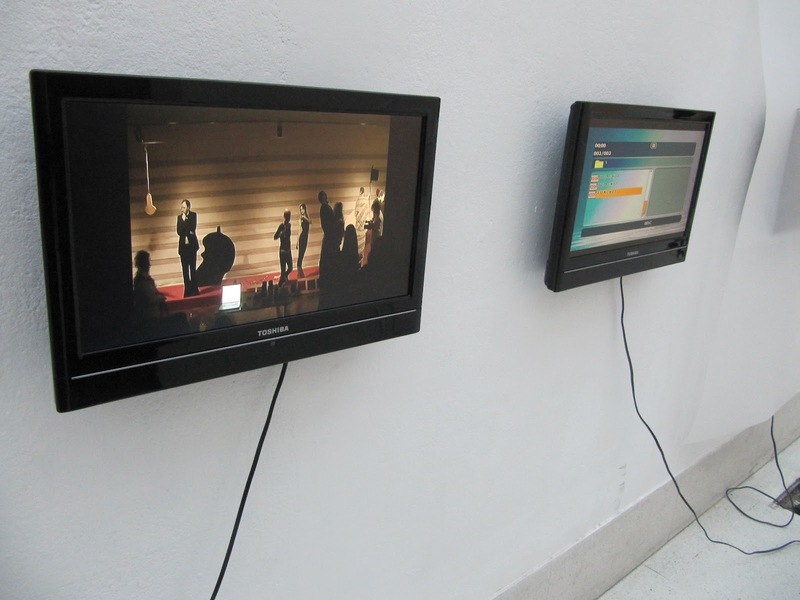 Developing its new context within the gallery alongside the writers work for An Event and the TV monitors playing scene’s from A Cut A Scratch A Score. I found the remnants of the materials used to form the volume intriguing. 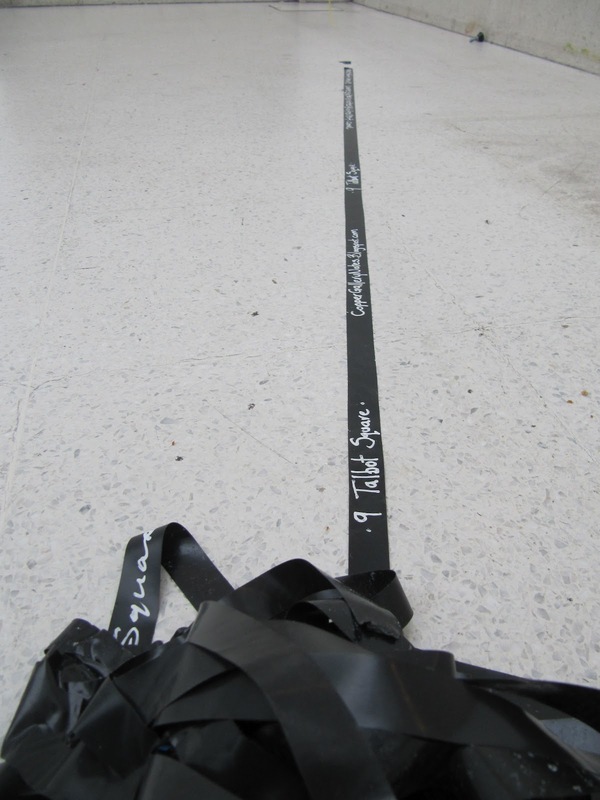 After the installation had been taken down, these materials used to represent the volume, that came from tape and string, quantifying a volume and line in space, turned back to tape and string, and in that action they became documents. In this useless form they suggest the possibility of another use. Re-staging and documenting. This is yet to be defined; a new context in which to be placed, and a new body of knowledge to be gained from that, and this manifestation shall credit its influence’s as they have been already been well documented. That’s the thing with knowledge, at least within an academic sense, the source must always be credited. 1. Interruptions to the writers train of though whilst writing in her in flat. 3.Referenced from transcriptions of A live ‘interview unlike any other’ with the acclaimed artist Bruce McLean featuring two of his films. 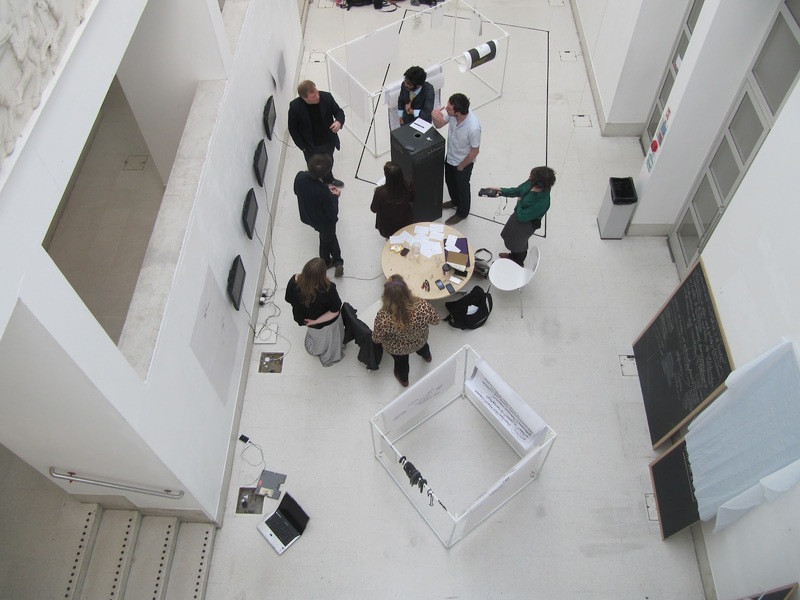 An Action of words: Writers in residency, John Dummett, Ajay Hothi and Christina Manning Lebek,29/03/2012 Royal College of Art, London. Lecture theatre.. Transcriptions by Sinead Bligh. 2012. 4.Source Sound.Sinead Bligh 2012. Please click on the link to hear the sound file. This sound suggesting the writers environment and the spatial context in which the writing was done, a washing machine also being cyclical and repetitive. Here the writer was also prompted to put on her washing by the influence of others doing so. To undertake in some kind of collaboration does there have to be a kind of commonality among the participants? There is a tendency in collaborations that those involved have agreed some kind of end, or interest in common subject matter leading to some kind of final product or event closure. Or is collaboration more about doing things in reaction to each other, where the end is more open, as opposed to working towards the same point. The inclination of the directionality of a collaboration, the common movement towards a point leads to an ending and stifles the movement of thought into organic directions throughout the process, and worse still can lead the agents to preforming the same actions in order to fulfill some kind of expectation for an outcome. John Dummett refers to collaboration as being a moving apart from a common starting point as opposed to moving together.1 In this way there is no end point, it is a process of knowledge, it continues into various different directions after the life of the initial collaboration. This seems like a more genuine collaboration if you consider that within your average collaboration, some thought is put forward in the initial development (generally for reasons of funding) and from that instance the point is chosen in which everything is moving towards. Leaving this end point undefined allows the space in which the agency of the collaborators is left with free reign. This mirroring in fact, the way society constantly evolves and our understandings are shaped, not generally from a predesigned trajectory to a point determined by another. This type of predesigned collaboration does however allow for reactionary collaborations. By setting the inclusion criteria for a certain collaboration, those that do not identify with that criteria form their apposing action or view; this way, the collaborative action causing the creation of other interactions in opposition to that. So it seems we are still collaborating in a way- just not crediting or credited for it. This leads to the question of the nature of agency within collaboration. If you take the opposite standpoint and decide on inaction, do you become a sort viewer/spectator? If you take no action within a collaboration; if you give nothing back, if you bring nothing to the table, are you seen as to not in fact be in collaboration at all. With the initial thoughts or discussion, does it seem like you are mute. I suppose this answer lies in whether or not you see the spectator as having agency; whether or not you assign an influencing importance to the viewer. Having the ability to react to a work or not is a power, one which I believe undoubtedly shapes consciously or unconsciously how we make. If we zoom out a bit and consider the space in which these relations take place I think we can afford ourselves the distance to consider how these dynamics between spectator and the agency which they excerpt on an artwork, form. If we consider cinema by way of example of spectatorship, we see an interaction with an art form and the public – in the realm of Artist Cinema, but also by way of main stream cinema. Here it is an interaction with an artform on a massive scale. Cinema speaks to and for society, propaganda has often been employed within this medium for precisely this reason. But in fact I think there is a good example here of how seemingly passive consumption can evolve into an active collaboration between the viewed and the viewer. Our contemporary society has been shaped by the past 100 years of cinema. Shaping our opinions, influencing our thoughts, encouraging new cultures, then sub cultures. The screen writer views and reflects on society and holds the mirror back up to it., all be it subjectively and with their own agenda’s, which is the case with all art forms. We see this with the best of cinema, but even with the worst; sub cultures and conflicting arguments evolve from a dissatisfaction and/or disagreement with what is portrayed and a reaction is formed. It is an organic collaboration, a movement from a defined starting point, moving outwards in other directions. Even in the case of mainstream cinema where blockbusters have been churned out to give the audiences what they want, (what will make money), there was a huge degree of interaction between media and culture to begin with to figure out what that is in order to capitalise on it. Sean Cubitt describes the cinema as ‘a special quasi – social space governed by ritual where the crowd is addressed as individual.6 This individual engagement within a public realm is extremely empowering, the viewer feels related to, directly addressed, whilst his neighbour is also addressed, perhaps in a differing way but there is empathy there. Empathy between the object viewed, the viewer and their fellow viewers. The cinema addresses the human desire to come together, to collect in one place, and experience. A feeling of inclusiveness which harbours down to the very nature of the notion of Place and the re-imaging of that, this which lies in at the centre of a cultural democracy. Within contemporary society, cinema exists within a context which is shaped by mass media, particularly by television.The interplay between these subject’s and their complexities would take up a whole PHD, and divert me slightly from my point, but it is the instance of the gathering in the cinema, the seemingly passive consumptive act on a mass scale, in which the performative action of specatorship is demonstrated clearly. It is an actual action where there seems to be inaction. The argument calling for a rethink of the agency of the spectator is well trodden ground, there has been a whole wave of artist and philosophers calling for a rethink of the notion of the audience as passive consumer, aesthetically and politically mute. Jaqcques Ranciere in this text The Emancipated Spectator, describes ‘emancipation’ in the terms of spectatorship as meaning: ‘the blurring of the boundary between those who act and those who look; between individuals and members of a collective body.’7 He goes on further to describe; ‘It (Art) requires spectators who play the role of active interpreters, who develop their own translations in order to appropriate the ‘story’ and to make it their own story. An emancipated community is a community of narrators and translators.’8 Within the context of A Cut A Scratch A Score and An Event we the artists played the role of the viewer/user/spectator. Existing on the fringes, but very much involved. 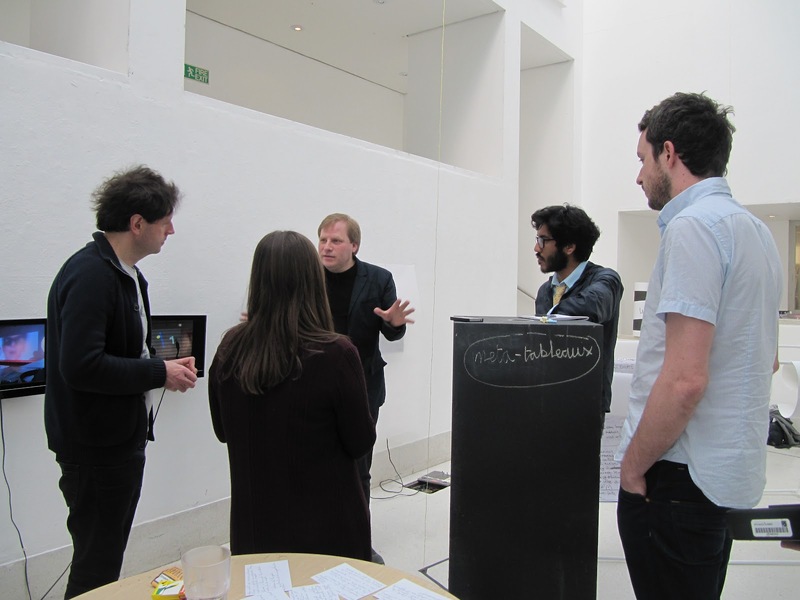 We reacted to what was being viewed both in situ and with the space of time. In fact the time it takes to respond to event’s such as theses and then to draw your own expression from that can be seen as an analogy for how the viewer responds, or in fact how we digest any kind of knowledge in general. It takes time to sink in; knee jerk reactions are the territory of the consumptive viewer. In a sense we were the emancipated (albeit from the privileged position of art educated) spectator invited to interact with the events and then left to our own devices in which we had the space to open up our own discourse. 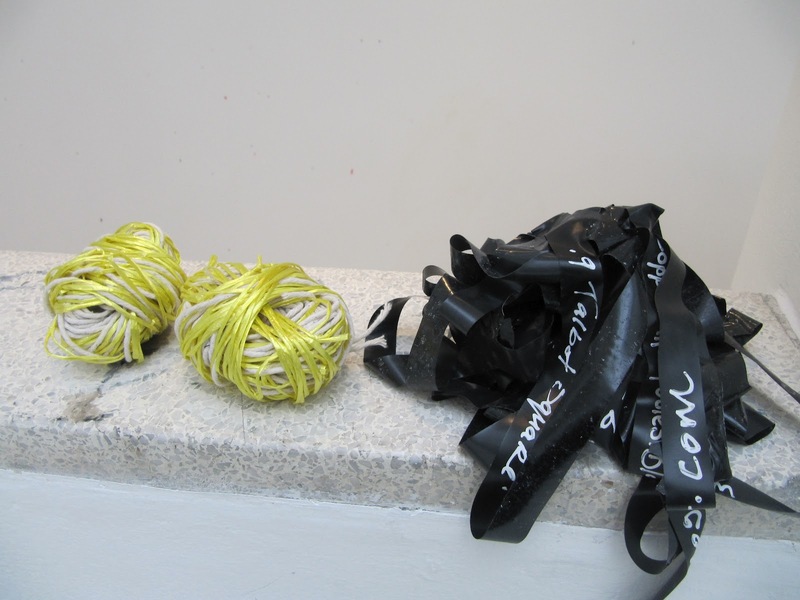 In this it was a true collaboration because the material generated became something of its own, not a documentary, a regurgitation of what was seen, but a subjective response to actions leading to other actions and in it that the communication of knowledge. All documentation is subjective, particularly those made by the viewer translating from their particular perspective, a sort of collaboration of thought. Documentation made of an action by the agents themselves gives a closer view of their own particular point of view and so perhaps this is more suitably included within the body of work its self. 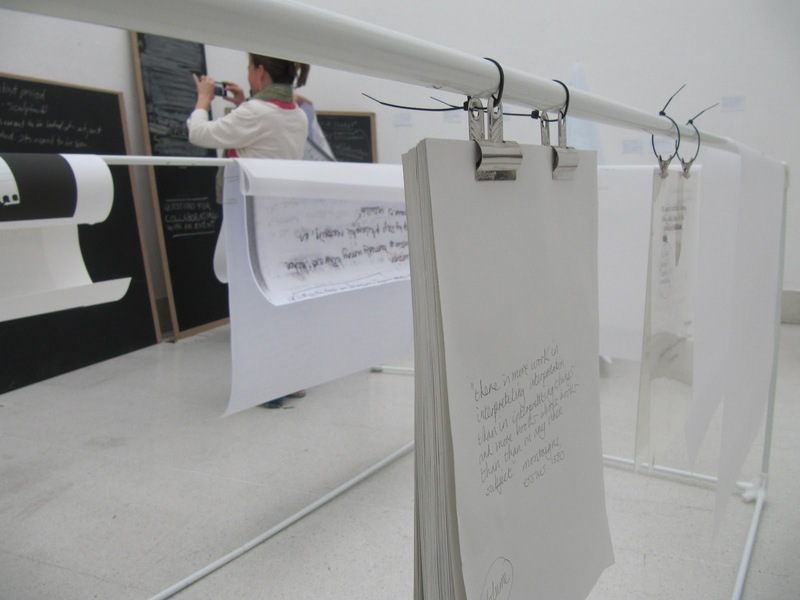 Not forgetting the role of the critical response, which lies halfway between both, or perhaps runs parallel, as an informed view (often given by the artist or researched by the critic themselves) and the subjective, creative response of the critic leading to text, a work of their own, and collaboration. These dynamics are at the center of Ranciere’s thesis regarding the emancipated spectator, the critique of the artwork by the spectator, and he places responsibility at the door of the artist to create work that cannot be simply passively consumed as it has to come from a society in which the spectator is in fact engaged and so should be given back something engaging. The rhetoric for collaboration permeates so many different spheres, whether they be social sphere’s, political sphere, economic sphere or service sector,9 in none of which the artist solely exists, so within the questioning of our modes of collaboration we can review our spaces for thoughts, as social and discursive entities and within that re – imagine the art world and artistic inquiry, to extend into wider spaces of interest to society as a whole. 1:John Dummott from transcriptions of A live ‘interview unlike any other’ with the acclaimed artist Bruce McLean featuring two of his films.An Action of words: Writers in residency, John Dummett, Ajay Hothi and Christina Manning Lebek,29/03/2012 Royal College of Art, London. Lecture theatre. Transcriptions by Sinead Bligh. 2012. 2:Text in red indicates interruptions to the writers train of thoughts whilst writing in her flat. 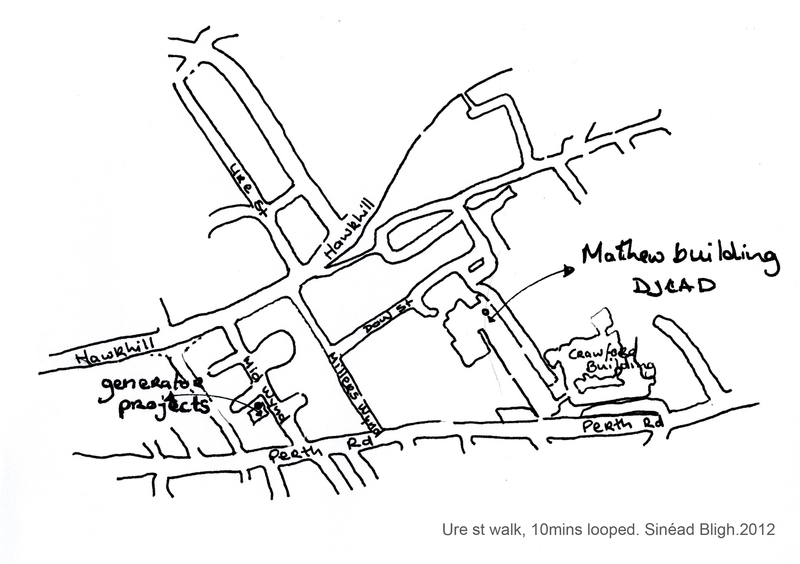 5:Sean Cubitt, ‘Projection: vanishing and becoming’, Media Art histories,ed (NewYork and London: Routledge, 2007) pg 412. 7:Jacques Ranciere The Emancipated Spectator, Verso 2009. pg 22. 8&9: Paraphrasing John Dummott from transcriptions of A live ‘interview unlike any other’ with the acclaimed artist Bruce McLean featuring two of his films.An Action of words: Writers in residency, John Dummett, Ajay Hothi and Christina Manning Lebek,29/03/2012 Royal College of Art, London. Lecture theatre. Transcriptions by Sinead Bligh. 2012.
second passage : documentation of documentation?